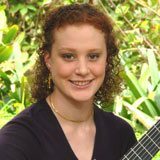 Jody Fisher is one of Australia’s leading young guitarists. She studied under Oliver Fartach-Naini at the Elder Conservatorium, where she graduated with first class double Honours and a Master’s degree. In 2011, whilst based in Europe, she performed and received tuition from maestro Eduardo Fernandez on full scholarship. Jody has been broadcast on the ABC (television and radio) Scholarships include the Dame Ruby Litchfield Award for Performing Arts, a Director’s Award from the Elder Conservatorium, the Michael Robert Poag Scholarship and a Helpmann Academy Optus Mentorship.